Nesting: What roles do the parents play during incubation? Question: Which parent is sitting on the eggs? What role do the parents play during incubation? Answer: Incubation does not begin until the third or fourth egg is laid and lasts until the eggs hatch in about 33 days. The female incubates all night. At or before dawn her mate goes out hunting. When he returns he calls to her and she leaves the nest to eat. The food exchange usually happens away from the nest. During this period the eggs are unattended. Soon after the food exchange the male comes to the nest and incubates the eggs. After the female has taken a break, she’ll return to the nest and resume incubation. The male will leave. At other times during the day the male will offer to incubate the eggs. 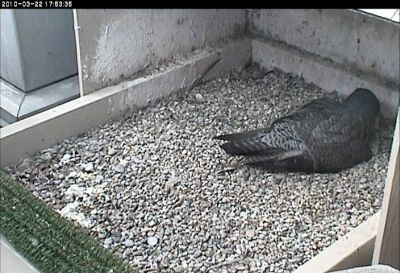 There is no set time, but at the University of Pittsburgh nest E2 normally relieves Dorothy for a couple of hours in early afternoon. The amount of incubating the male does depends on the couple’s preference. Some males share more incubation duties than others. In the middle of the incubation period, the male is on the eggs 30-50% of the daytime hours. Towards the end of incubation when the eggs are about to hatch, the female spends most of the time on the nest. She wants to be there to assist the chicks as they break out of their shells. So which parent is on the eggs right now? If it’s the middle of the night, it’s the female. Otherwise, you’ll have to watch closely at “shift change” to see which bird is larger. p.s. For information on incubation, click here and scroll down to the section beginning with “So, just how does incubation work?” at Rochester Falconcam. god love you! i really love all the facts, as i am new 2 the cyber world and bird watching at the age of 50!thank you very much for all the information, as a begineer i really appreciate all the info i can get my fingers on! happy easter too! Hi Kate, I just found this site. I fell in love with peregrines a couple of years ago. I watch the Rochester, NY nest. The nest has been like a soap opera the past two seasons. Birds have been injured due to territorial encounters. This year has been especially bad with toooooo many things to mention. I was so glad to find your nest. It looks like you will have a successful hatch and hopefully a successful fledge this year. I loved your information listed above and have it in my favorites so I can look back on it. Thanks.